Samsung Galaxy Tab 3 7.0 appears in new Blue hue, will it show up at IFA? Another 'Pebble Blue' Samsung device on the way? Samsung may be preparing to expand the colour options for its 7-inch Galaxy Tab 3, judging by an alleged leaked press shot, appearing to show the device in a nice shade of navy blue. The photo comes, as it so often does in these circumstances, from that serial Twitter leak artist @evileaks. Currently the device, which is pitched as a challenger to the Google Nexus 7 and Amazon Kindle Fire, is only available in brown and white hues. The Galaxy Tab series has almost become the forgotten Galaxy device in recent times, given the prominence of the Galaxy Note series, which is currently available in 5.5-, 8.0- and 10.1-inch iterations. It's unlikely that a new colour option would breathe much life into the range, but coupled with a Nexus 7 challenging price cut? Then Samsung might be in business. We're just over a week away from Samsung's Unpacked event on the eve of IFA. 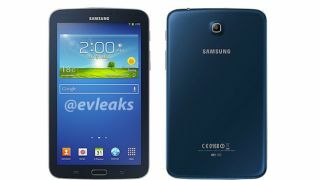 Will the blue Galaxy Tab 7.0 make an appearance? Let us know your thoughts in the comments section below. Something that is likely to make an appearance is the Galaxy Note 3. Here's all you need to know.